In direct response to the counterproliferation ACEs and the CINC counterproliferation required capabilities, the Counterproliferation Support Program supported a new Cooperative Army/Navy Hard Target Tactical Missile System initiative in FY 1997 to develop an earth penetrating variant of the Army's Tactical Missile System (TACMS) deliverable by the existing Army M270 tactical missile launcher and eventually by Navy surface ships and submarines. 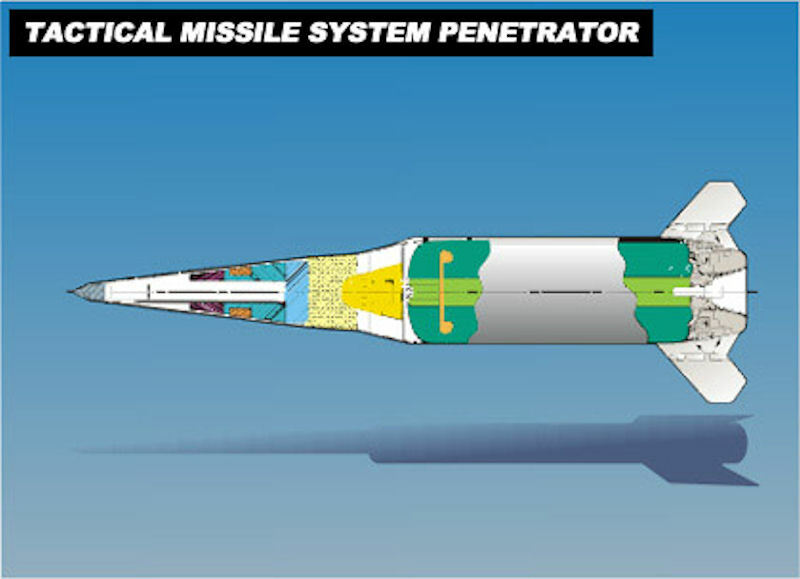 This variant, proposed by the Army TACMS program manager in conjunction with Navy Strategic Systems Programs, made use of the demonstrated capabilities of the Army TACMS missile system and reentry and penetrator components developed by the Navy to hold the full spectrum of NBC/M-related targets at risk. This project leveraged developments in strategic reentry systems technology (including aeroshells, attitude control systems, and guidance systems), advanced penetrator technology, and the Hard Target Smart Fuse (HTSF) under development by DSWA and the Air Force. Initial efforts focused on defining a near-term ATD to support an ACTD involving live fire testing in FY 1999. The TACMS-P demonstrated integration of the Army Tactical Missile System (ATACMS) booster with a Navy reentry vehicle resulting in an improved capability to destroy hard and deeply-buried targets. The TACMS-P range extends to 220 km and will be compatible with the MLRS Family of Launchers. The military’s conventional options for attacking hardened and shallow buried targets were limited to aircraft- delivered penetrating bombs — which generally don’t reach the needed levels of precision, rock-smashing velocities, or nearly straight-down impact angles. As part of an accelerated three-year effort, Sandia would design and develop the new Tactical Missile System – Penetrator (TACMS-P) and flight-test three prototypes at White Sands Missile Range, NM. It also would produce six battle-ready weapons — called residual units — for immediate inclusion in the US Army’s arsenal. The 2003 program was co-sponsored by the US Army and US Navy as an Advanced Concept Technol- ogy Demonstration. The Sandia portion of the program, being managed out of Aerospace Systems Development Center 15400, required the mating of an existing tactical weapon design — the Army Tactical Missile System (ATACMS) — with the design of a new warhead developed under Navy guidance. It drews on a broad spectrum of Sandia capabilities from centers including 2300, 2500, 2600, 2900, 3100, 9100, 14100, and 15400. Like the ATACMS, a standard ground-to- ground missile in the Army inventory, the TACMS-P was launchable from the Army’s Multiple Launch Rocket System (MLRS) and, following further development, potentially from US Navy submarines. TACMS-P program manager David Keese (15404) said the ability to launch penetrators from mobile launchers hundreds of miles away not only removes aircraft from harm’s way and provides for greater precision and depths of penetration, it also speeds the time between target selection and weapon delivery to minutes rather than hours, a desirable capability when targeting scenarios change quickly and frequently. The TACMS-P would provide a capability the Army and Navy have said they need in today’s war fighting situations. Sandia’s responsibilities included designing, fabricating, testing, and delivering the TACMS-P’s new payload and flight system. These systems include actuated fins that provide enhanced maneuverability during flight, advanced fuzing systems that sense depths and underground features, and improved navigation and control systems. The redesigned warhead also contained a new penetrator — a Sandia-patented cast steel sleeve called the Monolithic Ballasted Penetrator — designed to shed its skin as it rumbles through packed earth and concrete at thousands of feet per second. 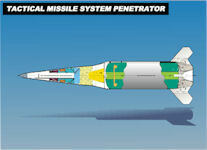 The penetrator contains insensitive high explosives and a Sandia fuze that would ultimately trigger the warhead and destroy the target. Sandia also integrated the new warhead with the TACMS-P transition system (the section between the warhead and rocket), modified by Lockheed Martin’s Missile and Fire Control Division. The Sandia team recently passed the first critical design review (CDR) by the program’s Army and Navy sponsors. “This is a critically important effort for Sandia, the Army, and the Navy to demonstrate our ability to cooperate on a program of mutual interest,” said Barry Hannah, US Navy Strategic Programs Reentry Systems Branch Head, the program’s primary sponsor. “The TACMS-P will provide an immediate capability for the Army, and a future capability for the Navy, to destroy hardened and buried targets, which has been identified by the services as a critical need,” he said. The first TACMS-P flight test was scheduled for September 2003 at White Sands, with the two additional flight tests approximately five and ten months later. The six usable residual units were scheduled be delivered to the Navy, then by the Navy to the Army, by late fall 2004. The six residual units also represent the first time a Sandia-fabricated weapon system will directly enter the US military’s conventional arsenal. Usually Sandia conduct the flight tests and someone else picks up, modifies for production, and manufactures the systems. In this case the Army wanted a few of the units right away. The Army said it might choose eventually to have a hundred or more TACMS-Ps built by a manufacturing contractor, but it didn't.